Humminbird Ice Helix 7 has an average rating of 2.8 out of 5 based on 5 user reviews. Humminbird introduced the latest fish finding innovation just in time for the 2016/2017 ice fishing season. The compact, portable and multi-function Ice Helix 7 is the big brother to the Ice Helix 5. With GPS, flash and sonar capability, the device is sure to enable anglers to find and return to productive locations on the water with more fish in tow. With this technology at hand, anglers spend more time catching and less time finding the fish. Grab the portable soft-sided case, which has an IPX5 waterproof rating and use the Ice Helix 7 while walking to your favorite fishing spot. Pack it on an ATV or snow mobile. The Ice Helix comes complete with the carrying bag, hardware, gimbal bracket, shuttle and a 12-volt 7AH battery plus charger. The unit itself measures a mere 10.54 inches x 5.44 inches x 1.13 inches. Regardless of the weather conditions, the fish finder is designed to deliver the information necessary for a successful day on the ice. Combined with on-ice function, the larger 7-inch high definition screen provides images in a 16:9 ratio, which means plenty of room for easily visible split-screen displays and multi-tasking capability. Anglers get a crisp picture of activity below the ice thanks to the bright LCD digital read-out that creates images in 256 colors on the LED-backlit screen at a resolution of 480×800 pixels. Get the image you need even when the sun shines or light reflects off the ice and snow. In split-screen mode, the screen displays both sonar and the graphic map of your choosing. The unit also has a zoom function that magnifies up to 8 times. Go to full-screen for the latency-free, six-color digital flasher. In flasher or sonar mode, the display takes the guesswork out of lure and swivel depths, water temperature and the presence of fish. Use the fish I.D. Function to find the specific sizes or species of fish that you are after. Humminbird’s patented DualBeam PLUS™ technology offers 20 degree and 60 degree coverage @ -10 db. Attached to the eight-foot cable, the transducer emits pings and receives returns at 83/200 kHz frequency ranges. Built-in target separation of up to 2.5 inches displays fish stacking activity. The transducer functions at a depths of up to 1,500 feet in fresh or salt water while operating at 500 to 4,000 watts of power. The narrow beam is ideal for noise-free accurate bottom imaging while the wider beam allows coverage of wider regions. The SwitchFire Sonar gives anglers control of how pings return to the device using the Clear and Max modes. In Clear Mode, the device filters weaker signals to ensure that the stronger return creates a clean, crisp image. The Max Mode in particular is favored by seasoned anglers who prefer modifying their fishing tactics based on precise conditions and environments. The Ice Helix also comes with UniMap cartography that is designed to display the United States coastline along with inland lakes and rivers at a resolution of 30 meters for every pixel. The 2x internal RAM loads and displays maps faster and continually refreshes the screen. The internal memory also provides anglers with the option of storing as many as 45 routes and 2,500 waypoints. The head of the device contains the GPS antenna. A built-in micro-SD card slot extends functionality by providing use of external software. The Humminbird Helix 7 is compatible with AutoChart®, LakeMaster® and Navionics® programs. Use external memory cards to record and save screenshots, sonar readings or waypoints. The card reader additionally enables users to upgrade the internal software free of charge from the “My Humminbird” page on the company’s website. During warmer months, take the Ice Helix 7 on a boat, canoe or kayak. Install the unit in or on the dashboard for the same degree of highly visible useful information. Affordable and precise, the latest addition to the Humminbird array of fish finders features a one-year limited warranty. As with all Hummingbird products, the knowledgeable tech support team is readily available to answer questions and provide tips. With the technology available to today’s angler, it is hard to imaging fishing without it. 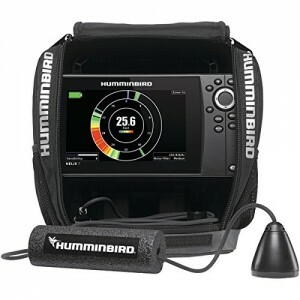 You can get a great deal on Humminbird Ice Helix 7 here. I like the unit but the assembly instructions are not very good. Step 1-9 requires to route cables in back of bracket and step 2-9 requires to route cable through big hole and to front. Also comes with black square pad with no explanation where it goes. Also, the front base has a brass mounting fixture but no explanation what that is for. The transducer cable does not have a bracket to secure to like the ice 55. Been using my unit for over a year now and I like it a lot. Many pluses. Bright screen, multiple views and modes, including flasher and column, and its very easy on batteries. I like the different color palletes choices, and the multiple sonar configuration possibilities, for different kinds of fishing. Cons are there too. Transducer is a pain, with dual cables, and no internal retainers or storage. No real choices of zoom modes, and target separation is not that great. The GPS takes a while to “lock on” and while you can save waypoint and markers instantly, its difficult to go back into the menu and name them. Finally, connecting battery charger is very hard. All in all, its a great unit, and will get plenty of use. Slick unit so far. Set up was a pain, but after seeing what this unit can do it’s all in the past. Definitely makes Fishing alot easier. And better than any flasher, I love the graph mode.